In Transit is a multidisciplinary exhibition featuring the work of five artists who have forged relationships with and documented the lives of individuals fleeing intolerable hardship by migrating into Europe over the last seven years. Focusing on the tentative, limbo-like experience of living between different cultures, the selection explores dynamic stories of immigrants and refugees who traverse the no man’s land existing between home and hope. Utilizing photography, performance, and filmmaking, each body of work in the exhibition examines the experiences of those thrust into a culture that is markedly different from their own. The artworks illustrate the physical and psychological challenges, while looking at the deeper discussion of what constitutes citizenship in the wake of these enormous migrations. Through their photographs, the artists strive to disrupt accepted misconceptions about immigration and otherness. In Transit is curated by Peggy Sue Amison and is a collaboration of Blue Sky Gallery, SDSU Downtown Gallery, and SF Camerawork. The exhibition and events are sponsored by the School of Art + Design, the College of Professional Studies and Fine Arts, Arts Alive SDSU, Bernard Osher Foundation, LensCulture, and East Wing Doha. Additional support is provided by the San Diego State University Art Council Ambassadors. Join us to celebrate the opening of the exhibition, "In Transit," on April 18 at 5:00 p.m. Mix and mingle with visiting artist George Awde and guest curator Peggy Sue Amison throughout the evening as you view the exhibition. Enjoy special performances by students and faculty from the School of Music and Dance. Take the Green Line towards 12th & Imperial. Exit the Green Line at the Santa Fe Depot. Cross Broadway at the corner of Kettner Boulevard to reach the Downtown Gallery entrance. Exit the Green Line at the Santa Fe Depot. Cross Broadway at the corner of Kettner Boulevard to reach the Downtown Gallery entrance. Exit the Blue Line at America Plaza. Cross Broadway at the corner of Kettner Boulevard to reach the Downtown Gallery entrance. Comprised of artwork created by faculty and students from the School of Art + Design, Futures Past and Present showcases works acknowledging the future in many arenas. The artworks in the exhibition consider not only how the future has been forecast in the past, but also how our present reality will inform what is yet to come. Collectively, the works reflect on personal ambitions, issues of environmental sustainability, urban growth, cultural transformations linked to gender, race, sexuality, and nationality, and technology’s influence on daily life. Futures Past and Present investigates many possible prospective scenarios, ranging from the utopian to the dystopian. The exhibition takes us on a journey through space and time, as we are invited into places that only exist through technology. The artists also pose existential questions relating to our own satisfaction and the ways in which we navigate a world that has come to rely on digital solutions. Futures Past and Present is co-curated by Professor Bridget Gilman and Chantel Paul, Director of the SDSU Downtown Gallery, and organized by the SDSU Downtown Gallery in collaboration with the SDSU Library's Special Collections and University Archives. The exhibition and events are sponsored by the SDSU Common Experience, the School of Art + Design, the College of Professional Studies and Fine Arts, and Arts Alive SDSU. Additional support is provided by the San Diego State University Art Council Ambassadors. Since their invention in 1817, bicycles have affected the progress of society in terms of both culture and modern industry. As a result of this broad impact, bikes have influenced artists over the past two centuries, with luminaries such as Marcel Duchamp and Pablo Picasso featuring bicycle parts in ground-breaking sculptures. Today, bicycles inspire a spectrum of international artists. 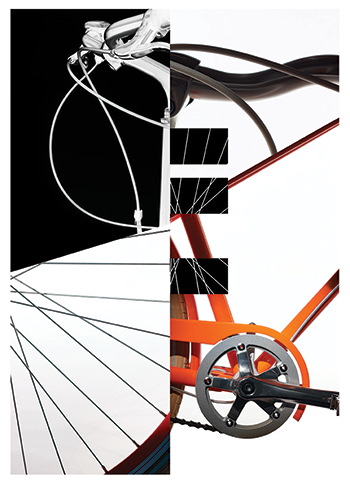 I Love to Ride My Bicycle presents work by contemporary practitioners from Argentina, Australia, Canada, France, the United States, and Vietnam who incorporate bikes as muse and material. Ranging from drawing, painting, and photography to sculpture, performance, and video installation, their artworks manifest the ongoing significance of two-wheeled human-powered vehicles. At the same time, the works convey the widespread enthusiasm for bicycles expressed by the title of the exhibition. I Love to Ride My Bicycle is curated by Professor and Senior Curator Tina Yapelli and organized by the SDSU Downtown Gallery. The exhibition and events are sponsored by the SDSU Common Experience, the School of Art + Design, the College of Professional Studies and Fine Arts, and Arts Alive SDSU. Additional support is provided by the San Diego State University Art Council Ambassadors. Community partners are the San Diego County Bicycle Coalition and the San Diego Mountain Biking Association. Downtown at Sundown is a partnership with the Museum of Contemporary Art San Diego (MCASD). It is held on the third Thursday of each month. Park in Parking Structure 3 just east of College Avenue. Park only on levels 1-3. 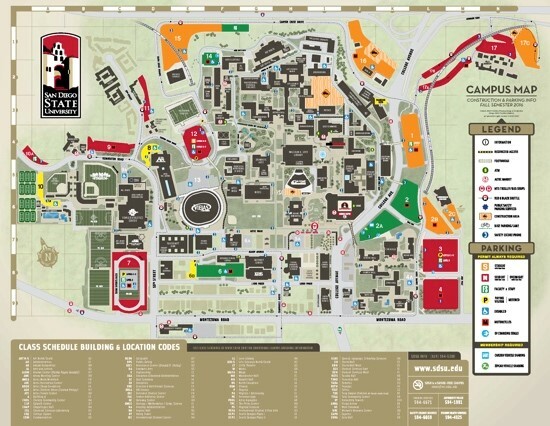 Purchase a parking permit from one of the yellow permit vendors on level 1. Permits are $3/hour (for 1-4 hours). Walk North West through Parking Structure 2 and across the small pedestrian bridge over College Ave. and past the Business Administration building. Walk through Student Services East and into the large plaza. Room SSW-1500 is in Student Services West on the Plaza Level. Join us to celebrate the opening of the exhibition, Tom Loeser: Please Please Please. 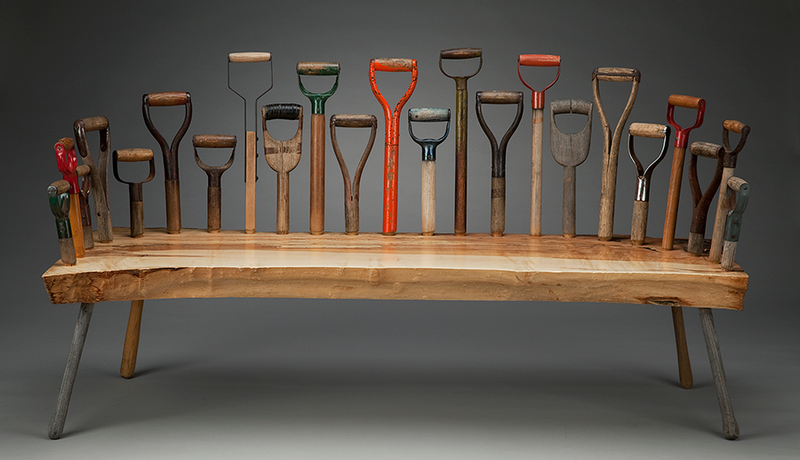 Mix and mingle with Madison-based designer/maker, Tom Loeser throughout the evening as you view the exhibition. His accomplishments and contributions to the American Studio Furniture movement have been influential to field and the generations that have come after him. This is the first solo exhibition of Loeser’s work in San Diego. Tom Loeser designs and builds one-of-a-kind functional and dysfunctional objects that are based on the history of design and object-making as a starting point for developing new form and meaning. He has been head of the wood/furniture area in the Department of Art at the University of Wisconsin, Madison since 1991. He holds a BA from Haverford College, a BFA from Boston University and an MFA from the University of Massachusetts, Dartmouth. Loeser is the recipient of four Visual Artist Fellowship Grants from the National Endowment for the Arts and an NEA Creative Artist Exchange Fellowship. His work has been featured in many national and international exhibitions and is in the collections of the Smithsonian Cooper-Hewitt National Design Museum, Museum of Art and Design, Rhode Island School of Design Museum of Art, Museum of Fine Arts and many other institutions. He was elected to the American Craft Council College of Fellows in 2012. Tom Loeser: Please Please Please is co-presented by the Houston Center for Contemporary Craft and the Museum of Craft and Design and curated by Glenn Adamson. 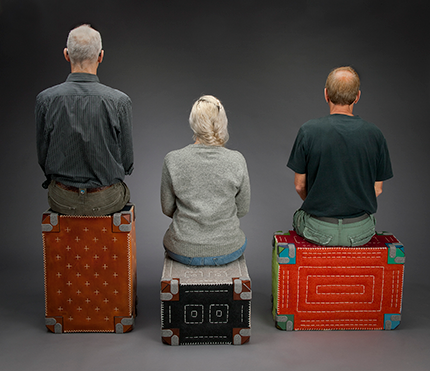 The exhibition and events are sponsored by Ron Abramson, Diane Powers, Rob Sidner, the Allied Craftsmen of San Diego, Wendy Maruyama and Bill Schairer, Reuben Foat, and the Visiting Artists and Lecturers Committee. Additional support is provided by the School of Art + Design, the College of Professional Studies and Fine Arts, Arts Alive SDSU, and the San Diego State University Art Council Ambassadors. If the furniture we sit on every day were totally different, would our lives be different too? That is one question posed by Madison-based designer/maker Tom Loeser. His longstanding investigation of unconventional, invitational furniture forms began in the early 1980s with a series of Folding Chairs, colorful seats that double as wall-hung art. In more recent years, he has made chests that swivel and slide, rocking chairs for two, rotary-action benches, and many other surprising shapes. When in use, these pieces immediately create opportunities for interaction – not only between people and objects, but between people and other people too. Accessible and entertaining, to be sure, Loeser’s work also has a purpose: to shake up our habits and encourage us to be playful with our environment and with one another. The exhibition is comprised of approximately 14 furniture pieces by Loeser, most of which are newly made, as well as framed artworks. This exhibition was curated by Glenn Adamson. This exhibition is accompanied by an illustrated publication with essays by guest curator Glenn Adamson and author of Amateur Craft and Theory, Stephen Knott. Thursday, August 16, 5:00 – 8:00 p.m.
Tuesday, September 18, 5:30 p.m.
Thursday, September 20, 5:00 – 8:00 p.m.
Thursday, October 18, 5:00 – 8:00 p.m.
Give-and-Take: Poster Design by Nancy Skolos and Thomas Wedell presents the work of this graphic design twosome, who pioneered the medium from a traditional analog approach to its contemporary inclusion of digital technology, beginning in 1989. Working collaboratively for over 30 years, Skolos and Wedell have consistently pushed the boundaries of art, design, and technology by moving fluidly between graphic design and photography, analog and digital, 2D and 3D forms. With a passion for process, the artists build elaborate models that are photographed and digitally combined, blending graphic elements and typography as foundational aspects for their graphic design. Nancy Skolos and Thomas Wedell, belong to what Wedell calls the “bridge generation,” those transitional years when designers skilled in traditional analog techniques shifted towards digital technology. “We understand both worlds and easily move between them,” says Wedell. “The poster format is like a threshold into another world. It frames an idea. It lets you play with amazing scale shifts,” says Skolos. The results are deep illusory spaces populated by shape and texture, color and form, which draw viewers in through the flat surface of the poster. Give-and-Take showcases, for the first time in southern California, a seminal selection of posters, 3D models, and related ephemera that share the creative journey of this world-renowned husband and wife duo. Nancy Skolos and Thomas Wedell have been widely published and exhibited, with posters included in the graphic design collections of the Museum of Modern Art, Metropolitan Museum of Art, the Cooper Hewitt Smithsonian Design Museum, the Library of Congress, the Victoria and Albert Museum, the Israel Museum, and the Museum für Gestaltung, Skolos is an elected member of the Alliance Graphique Internationale and a Boston AIGA Fellow. In 2017 they were awarded the AIGA Medal for their outstanding contributions to the field of design and visual communication. 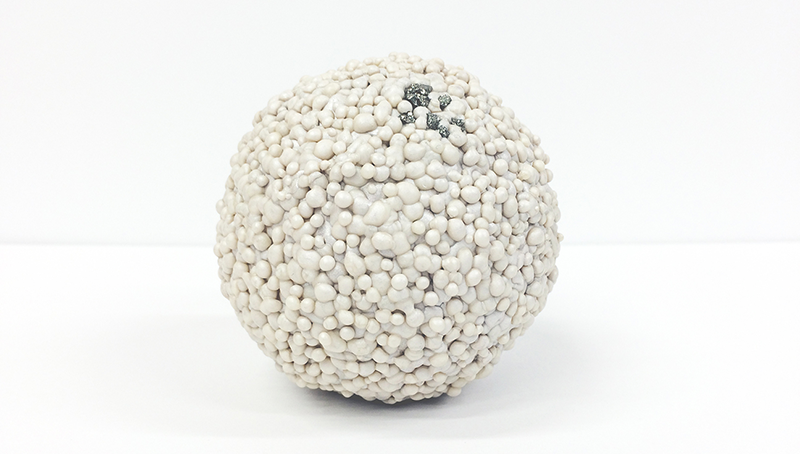 Give-and-Take is curated by Professor Susan Merritt and organized by the SDSU Downtown Gallery. The exhibition and events are sponsored by the Visiting Artists and Lecturers Committee, the SDSU Common Experience, the School of Art + Design, the College of Professional Studies and Fine Arts, and Arts Alive SDSU. Additional support is provided by the San Diego State University Art Council Ambassadors. Thursday, April 19, 5:00 – 8:00 p.m.
Friday, April 20, 9:00 - 10:00 a.m.
Thursday, May 17, 5:00 – 8:00 p.m.
Thursday, June 21, 5:00 – 8:00 p.m.
Thursday, July 19, 5:00 – 8:00 p.m.
For this installment of Downtown at Sundown, join us for an evening of film and conversation. We will be featuring a screening of the film Straight from the Pen, directed by SDSU Emeritus Faculty, Paul Sutton and co-directed by Lori Sutton. The film explores the realities of the prison system and how creative writing can be a tool for rehabilitation. Twenty-four prisoners come face-to-face with a dozen college students on a maximum-security prison yard. The writing that emerges is life changing, as prisoners trade the alienation, disaffection, and violence for openness and honesty. Though their often-intimate collaboration, both groups find hope and humanity in a place where they expected neither. The screening will be followed by a Q&A conversation with Robert Gullett and Kevin Howerton, and others who are featured in the film. Downtown at Sundown is in partnership with the Museum of Contemporary Art (MCASD) on the third Thursday of every month from 5 to 8 p.m. Neighborhood restaurants including Aaharn Thai, Carnivore, Waters, and The Stone Brewing Company Store will stay open late. Check MCASD website for details about each month’s activities. Comprised of artwork created by faculty and students from the School of Art + Design, Transforming Existence explores Surrealism with works ranging from those that were inspired by the movement’s icons such as Salvador Dali, René Magritte, Joan Miró, and Dorothea Tanning to contemporary approaches, transporting us into the mind’s eye of each artist. The selection in Transforming Existence investigates the ways surrealistic combinations allow artists to understand personal experiences, relationships, and society, employing imagery depicting the absurd or strange to elements that promote introspection. 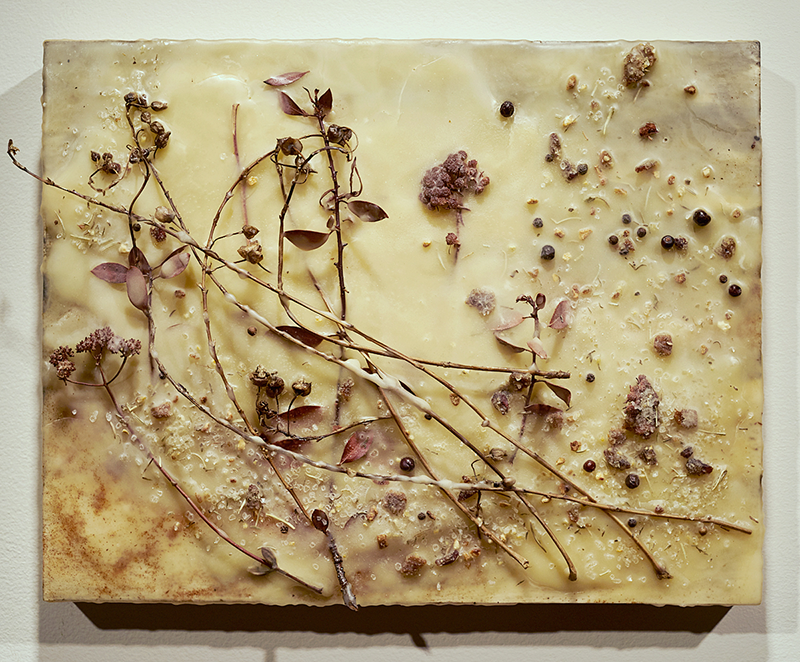 Transforming Existence is organized by the SDSU Downtown Gallery. The exhibition and events are sponsored by the SDSU Common Experience, the School of Art + Design, the College of Professional Studies and Fine Arts, and Arts Alive SDSU. Additional support is provided by the San Diego State University Art Council Ambassadors. Thursday, February 15, 5:00 – 8:00 p.m.
Thursday, March 15, 5:00 - 8:00 p.m. 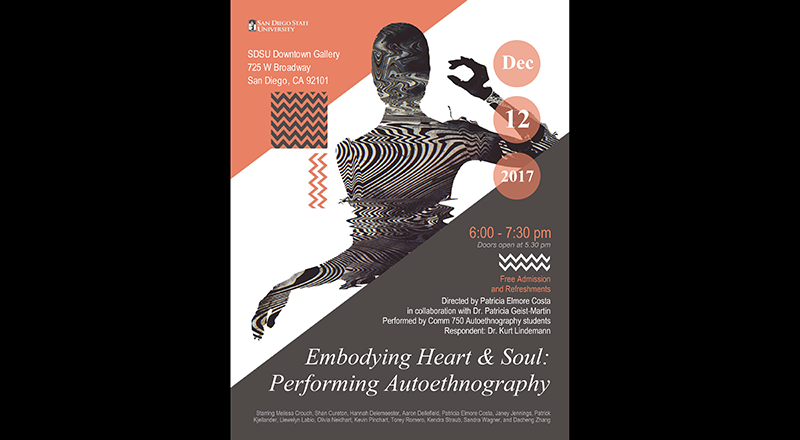 In this unique performance, 14 School of Commmunication graduate students from an Autoethnography seminar taught by Dr. Patricia Geist-Martin will read/perform 5 minute selections from their final projects. For this installment of Downtown at Sundown, join us for an evening of live music, dance and film in our gallery. View the current exhibition, We Are Here/Estamos Aquí and experience a flamenco dance performance by DanzArts/La Esencia Flamenca, followed by a screening of the film Exiled from San Francisco Bay-Area filmmaker, Mike Seely. From 5:30 – 6:45 p.m., DanzArts/La Esencia Flamenca will take you on a journey through southern Spain. Enjoy two performances featuring live guitar and flamenco dancing. Danzarts is under the artistic direction of Patricia Astorga-Casey. 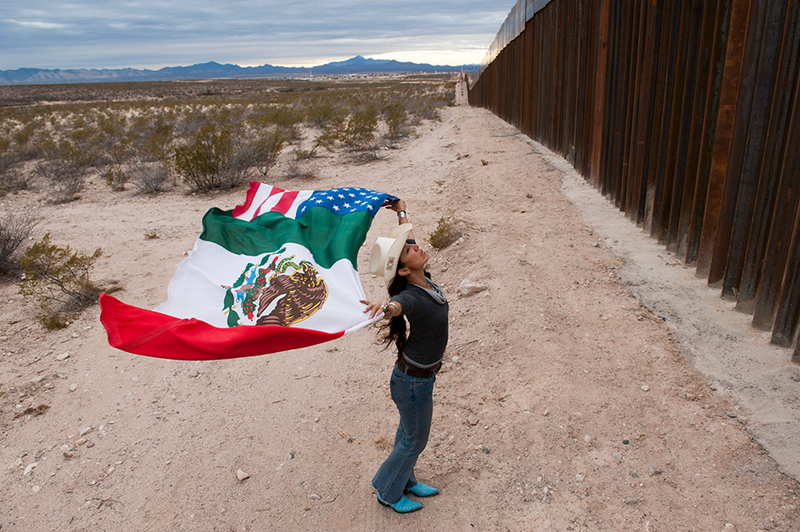 From 7:00 – 8:00 p.m., filmmaker Mike Seely will present his documentary, Exiled. The film focuses on two military veterans, both green card immigrants, willing to die for their country, who found themselves deported and are now fighting to be heard. Exiled is a persuasive and intimate look at the human consequences of current U.S. immigration policy. Spaces from Yesterday: Amy M. Ho with Chanthon Bun, Dennis Crookes, and Bobby Dean Evans, Jr. features three projects developed by Amy M. Ho in collaboration with incarcerated artists from San Quentin State Prison. Based in the San Francisco Bay Area, Ho worked for several years as an art teacher at the prison and “learned from the inmates about the human capacity for change, the resilience of the human spirit, and the innate desire for self-expression.” The works included in the exhibition represent specific places that were significant to the inmates’ lives before prison. These places and the events that occurred in them were described to Ho in conversations that took place while she was teaching, and that gave her insight into the ways in which imprisoned artists use their memory of locations and attendant experiences to maintain ties to the outside world. The Garage comprises an installation by Ho that recreates the garage workspace of Bobbie Dean Evans, Jr.’s childhood home, as well as his painting of the remembered space. Similarly, The Last Summer is an installation by Ho that is accompanied by two paintings by Chanthon Bun. Ho’s work with Dennis Crookes, who has been released from prison and currently lives in Los Angeles, includes his large-scale painting of The Hallway and Ho’s models for the installation. Each of the projects is intended to help preserve the inmates’ memories and serve as a platform to share their stories beyond the prison walls. Spaces from Yesterday is curated by Professor Tina Yapelli and organized by the SDSU Downtown Gallery. The exhibition and events are sponsored by the School of Art + Design, the College of Professional Studies and Fine Arts, and Arts Alive SDSU. Additional support is provided by the San Diego State University Art Council Ambassadors and Chandra Cerrito Contemporary, Oakland, California. August 3, 2017 6:00 p.m. – 8:00 p.m.
Borderclick invites you to the final of a series of three Community Dialogues around transborder identity through the eyes of young transfronterizxs who live and work between Tijuana and San Diego. We invite you to explore the idea of Art as Activism, photography and archiving as Community Service, and the humanization of the border experience. This project was made possible in collaboration with San Diego-based non-profit, The AjA Project, with support from the California Arts Council and California Humanities, a non-profit partner of the National Endowment for the Humanities. July 27, 2017 5:00 p.m. – 8:00 p.m.
Join us to celebrate the opening of We Are Here/Estamos Aquí. Mix and mingle with the artists while viewing photographic images depicting the dynamic social aspects of the U.S./Mexico border. The selection of artwork in the exhibition shares individual experiences, explores the impact of border crossing, and investigates the ways the cultures of Mexico and the U.S. are shaped by their proximity to one another. Artists include Stefan Falke, Ingrid Hernandez, Tom Kiefer, Pieter Wisse, and Borderclick, a group of young artists connected through San Diego non-profit, The AjA Project. We Are Here/Estamos Aquí features the use of photography as a mode of storytelling and agent for social change through images depicting the dynamic social aspects of the U.S./Mexico border. Downtown San Diego is situated less than 20 miles from the international border at the San Ysidro Port of Entry; the busiest land border crossing in the world. We Are Here/Estamos Aquí looks at 2,000 miles of our southern border from Texas to California as a place where lives are shaped. Ranging from portraiture and still life to installation-based work, the selection of photographs shares individual experiences, explores the impact of border crossing, and investigates various ways the cultures of the U.S. and Mexico, and San Diego and Tijuana are influenced by their proximity to one another. Photographers included in the exhibition are Stefan Falke, Ingrid Hernandez, Tom Kiefer, Pieter Wisse, and Borderclick, a group of young artists connected through San Diego non-profit, The AjA Project. We Are Here/Estamos Aquí is organized by the SDSU Downtown Gallery. The exhibition and events are sponsored by The President's Leadership Fund, Hahnemühle, The AjA Project, Rolando Gutierrez, the School of Art + Design, the College of Professional Studies and Fine Arts, and Arts Alive SDSU. Additional support is provided by the San Diego State University Art Council Ambassadors. Friday, August 3, 2017: Community Dialogue on Art as Activism w/Borderclick, from 6:00 - 8:00 p.m.
Thursday, August 18, 2017: Downtown at Sundown, from 5:00 - 8:00 p.m.
Thursday, October 19, 2017: Downtown at Sundown, from 5:00 - 8:00 p.m.
Join us for Downtown at Sundown to celebrate the opening of All Natural. Mix and mingle with the artists while viewing experimental, unique, and in some cases, never-before-seen works. All Natural includes the work of Stephanie Bedwell, Jennifer Anne Bennett, scott b. davis, Roman de Salvo, John Oliver Lewis, Jessica McCambly, Meghann Riepenhoff. A special program of the evening is a performance from the SDSU School of Music and Dance. SDSU dance students are joined by local dance professionals to perform a "durational practice" in our gallery. This performance/practice requires physical commitment to a single activity for one hour, extending the dancers' technical abilities and focusing their attention on the change of state occurring during the performance, both as individuals ad as a group. Throughout the performance, the dancers consider questions, including: How can we sustain a specific, internal focus and perceive our relationship to changing surroundings? If we practice a quality and duration of attention that evokes a change of state in ourselves, how might that influence the state of the group? The state of those passing by? What is the relationship between "experiment " and "experience"? The score we are practicing is based on repetition AND never repeats. 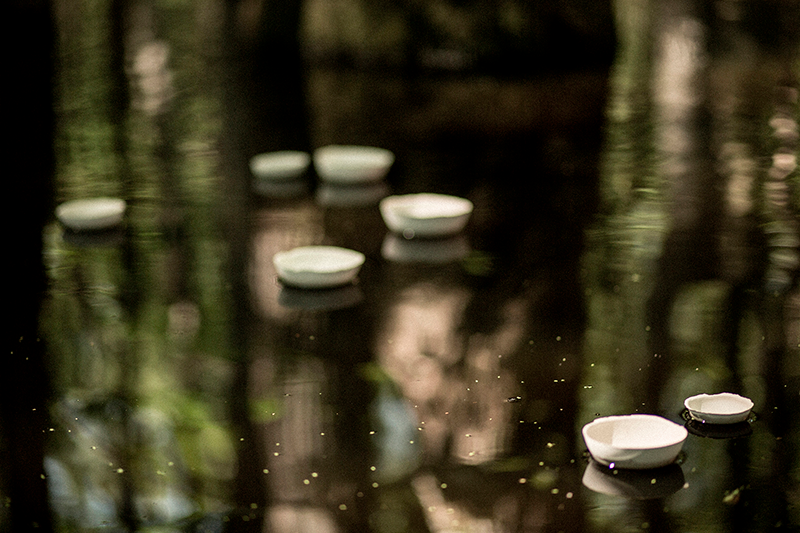 This series of Durational Performances are supported by SDSU Arts Alive. 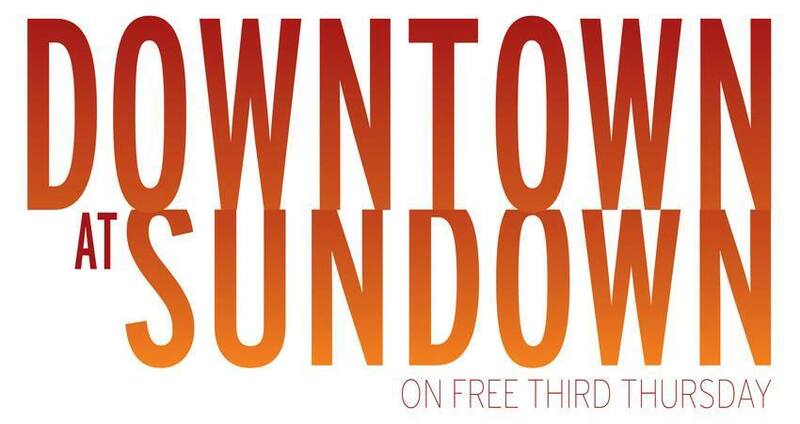 Downtown at Sundown is in partnership with the Museum of Contemporary Art (MCASD), Stone Brewing Co., and The Flight Path Wine Bar & Bistro, on the third Thursday of every month from 5 to 8 PM. Check the MCASD website for details about each month’s activities. Every Which Way is the third in an annual series of exhibitions inspired by San Diego State University’s campus-wide initiative, the Common Experience. Comprised of artwork created by faculty and students from the School of Art + Design, the exhibition explores the current theme “Experience Movement” through multiple disciplines and interpretations. The selection in Every Which Way includes approaches ranging from participatory and playful to pieces that examine political and social issues. Visitors will be able to interact with a piece by Arzu Ozkal made of handcrafted movable magnets and see the art-making process revealed with Peter Scheidt’s mobile woodworking shop. Historical and contemporary social issues are visible in Mary Cale A. Wilson’s video exploring an event that occurred in the American South during the Civil War and as wearable art created by jewelry students addressing current events and topics. As part of the exhibition, the Downtown Gallery will host a series of pop-up programs, creating a multi-sensory experience. Join us for activities and performances throughout the run of the show. Please visit our Facebook for an ongoing schedule of planned events. Every Which Way is organized by the SDSU Downtown Gallery. Support for the exhibition and events are sponsored by the Common Experience, the School of Art + Design, the College for Professional Studies and Fine Arts, and Arts Alive SDSU. Additional support is provided by the San Diego State University Art Council. Thursday, February 16: Opening Reception, 5:00 p.m. – 8:00 p.m.
Thursday, March 16:Downtown at Sundown with AjA Project, 5:00 p.m. – 8:00 p.m.
An ongoing list of additional pop-up events will be visible on our Facebook page. Depravities & Monuments features a selection of artworks from two incisive series by Los Angeles artist Sandow Birk. 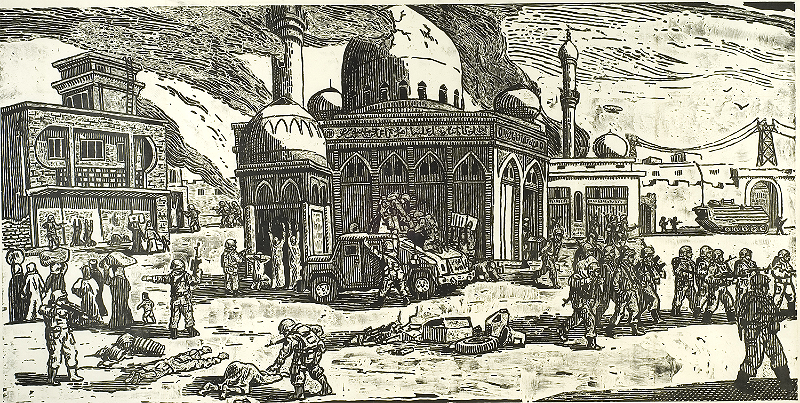 The Depravities of War, comprising a narrative suite of monumental woodcut prints, proffers a stinging critique of the Iraq war and its aftermath. Birk harks back to Jacques Callot’s The Miseries and Misfortunes of War (1633), a series of etchings that delivered biting commentary on Europe’s Thirty Years’ War and inspired Francisco Goya’s damning print series The Disasters of War (1810–1820), which expressed horror at the bloody conflicts between Spain and the French Empire. As did his predecessors, Birk depicts the events of his own time to condemn the gruesome practices and devastating consequences of armed combat. Imaginary Monuments, consisting of outsize drawings and etchings, proposes public memorials to laws, treaties and declarations devised to structure the conduct of global society. At once deadpan and tongue-in-cheek, the works illustrate Birk’s fantastical plans for monuments to wide-ranging topics, such as human rights, criminal justice, U.S.-involved military engagements, international football, the Internet, the world’s oceans and outer space. Together, the Depravities and Monuments series cogently address conditions and concerns of contemporary life. Sandow Birk: Depravities & Monuments is curated by Professor Tina Yapelli and organized by the SDSU Downtown Gallery. The exhibition and events are sponsored by the School of Art + Design, the College of Professional Studies and Fine Arts, and Arts Alive SDSU. Additional support is provided by the San Diego State University Art Council. Sandow Birk is represented by Catharine Clark Gallery, San Francisco, and Koplin Del Rio Gallery, Seattle. Thursday, November 17: Opening Reception, 5:00 p.m. – 8:00 p.m.
Thursday, December 15 and January 19: Downtown at Sundown, 5:00 p.m. – 8:00 p.m., an after-hours offering activating the Core-Columbia neighborhood with a host of perks to pique your interest on the third Thursday of every month.